toward the east a series of vaults, similar to the vaults under the street along the Western Wall, were built to support it. These vaults, or arches, supported the street along the southern wall and were also used as shops. Mount down to this course of large ashlars on the south and quit. 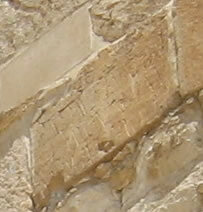 The cut margins and the raised bosses of a course of Herodian ashlar can be seen setting below by Galyn's feet at street level. The Mount of Olives can be seen in the background. 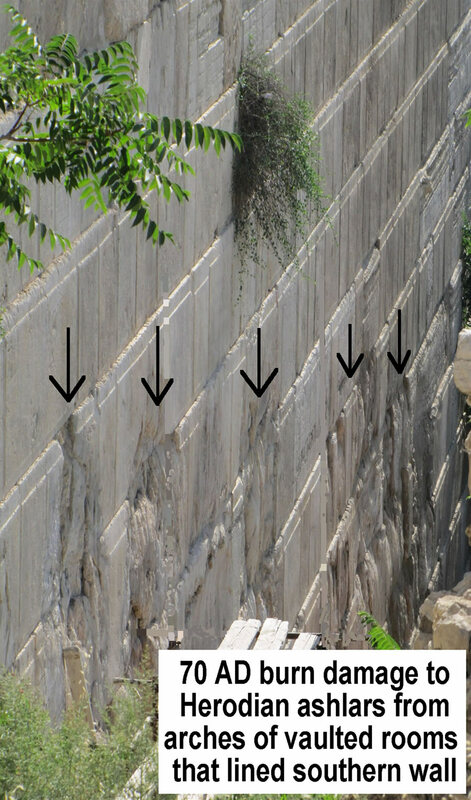 CLICK HERE FOR A MUCH LARGE IMAGE OF THE VIEW OF THE SOUTHERN TEMPLE MOUNT WALL FROM AS SEEN FROM SOUTH OF THE CITY OF DAVID. Above: This is a view of the eastern two-thirds of the southern wall. Notice the how quickly the ground level drops off as the wall continues toward the east (right). The dome of the Al Aqsa Mosque can be seen where Solomon’s Porch, or the Royal Stoa, of the Jews once stood on the south side of the Temple Mount. 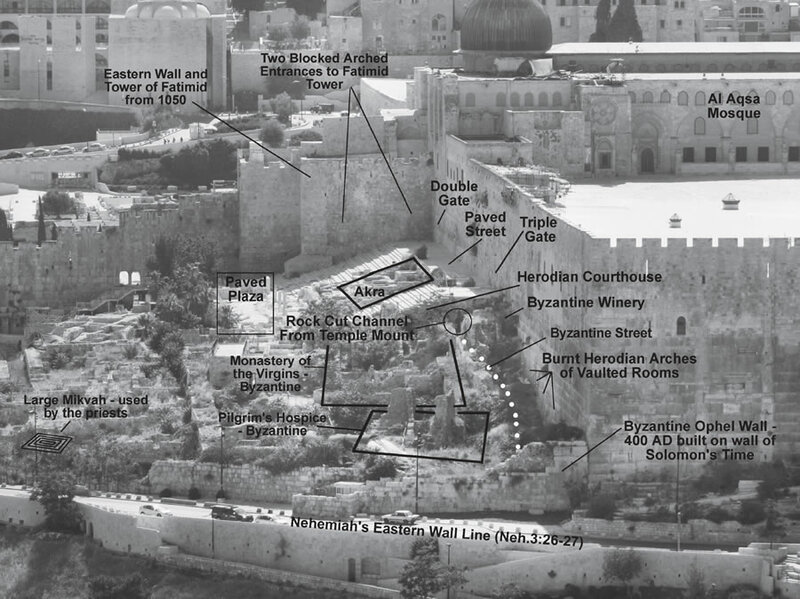 Since 1967 when the Israelis took control of eastern Jerusalem, extensive excavation has been done in this area called the Ophel south of the Temple Mount. 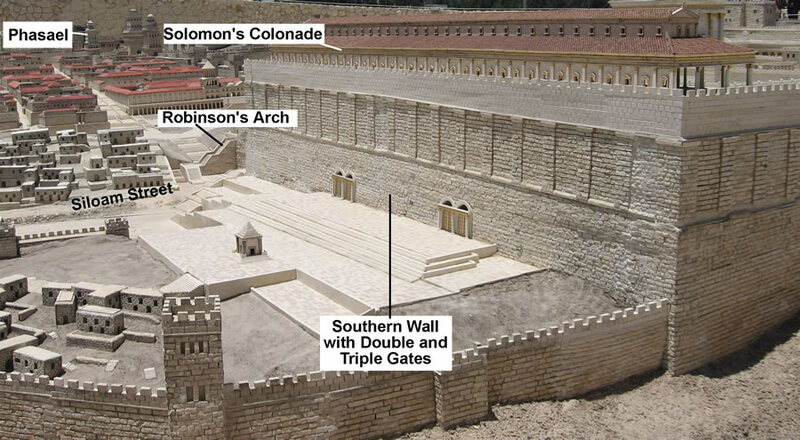 A labeled model of the south wall of the Temple Mount as it appeared in 66 AD. A view of the south wall of the Temple Mount from the Mount of Olives. the two large sets of stairs (not labeled) leading up to the Double and Triple Gates. It may also be of interest to recognize where the remains of the Akra, the old Seleucid fortress, is. The same view as above but closer and in color. 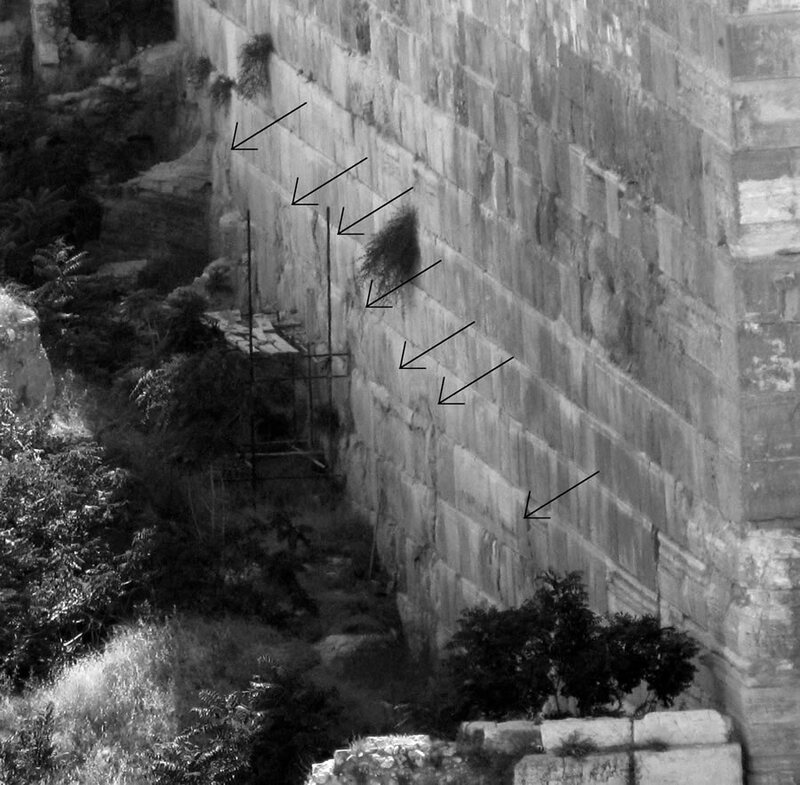 The worn steps cut into the bedrock of Mount Moriah as it ascends to the Temple Mount in front of the Double Gate in the Ophel. when they built their fortification in about 1129 AD. 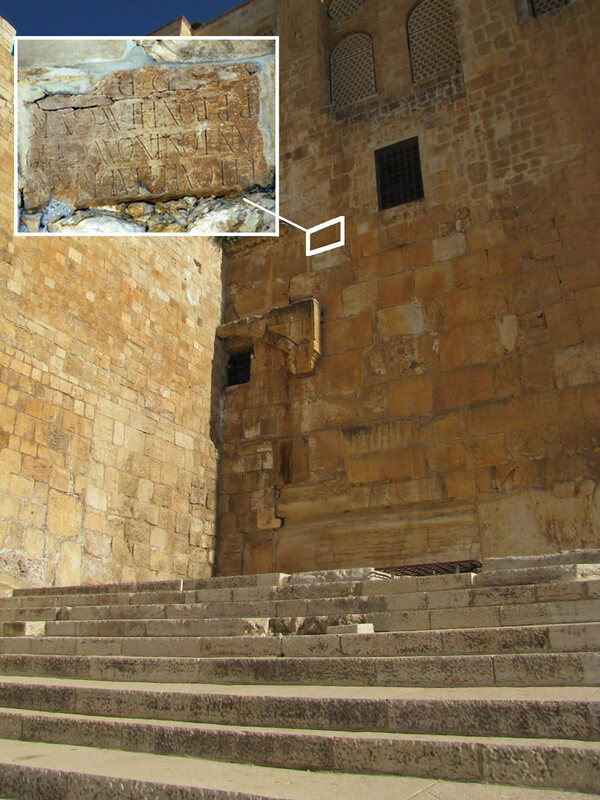 led to a set of stairs that brought the worshipper up to the surface of the Temple Mount. The distance from the street level in front of the Double Gate up the stairs to the Temple Mount surface is about 46 feet. the f[ather] of the f[atherland], pontif[ex], augur. because of the events recorded in Acts chapter 2.
revolt was quenched in 135 AD. entrance. Below the trapezoidal stones is a large horizontal stone with a wide margin and boss carved into it. 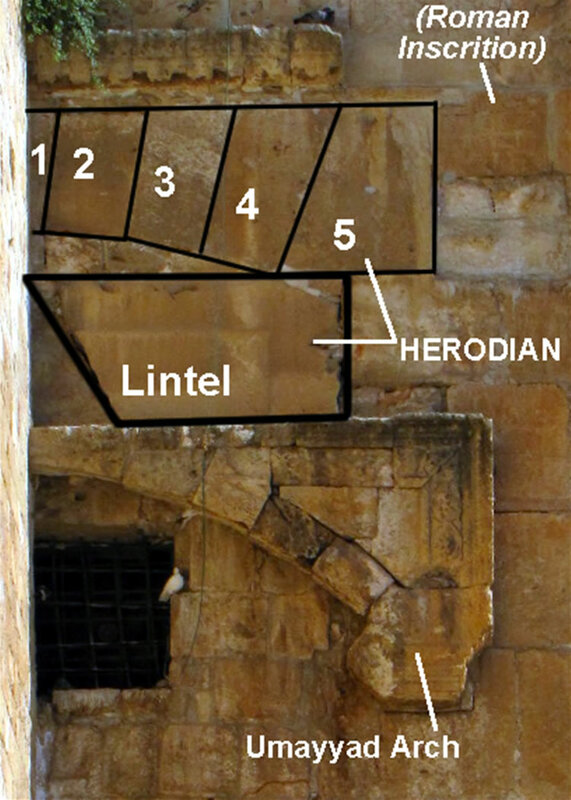 This is the lintel for the Herodian Double Gate. To the left behind the Crusader wall, the rest of the gate can be seen. and John about to enter, he asked them for money . . . Then he went with them into the temple courts, walking and jumping, and praising God. When all the people saw him walking and praising God, they recognized him as the same man who used to sit begging at the temple gate called Beautiful . . . While the beggar held on to Peter and John, all the people were astonished and came running to them in the place called Solomon’s Colonnade. and is 51 feet wide. Each of the three gates is 13 feet wide with two 6 foot piers separating them. through this gate that led up to the outer courts and Solomon’s Porch, where the early church in Jerusalem met daily. 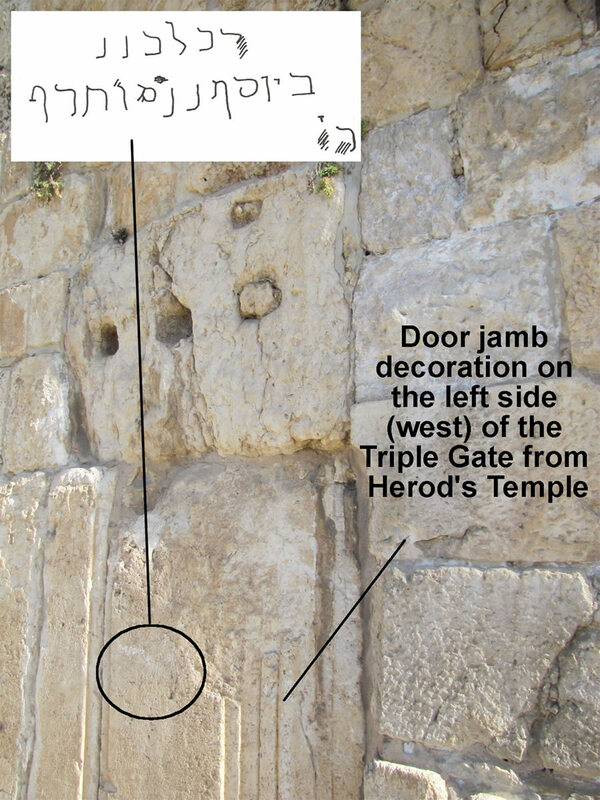 This is the left (west) side, or jamb, or the Triple Gate. This stone was part of the New Testament gate called "The Beautiful Gate." had died. The inscription is dated at around 750 AD when the Muslim Abassid dynasty ruled, and Jews could only worship at the gates of the Temple Mount. 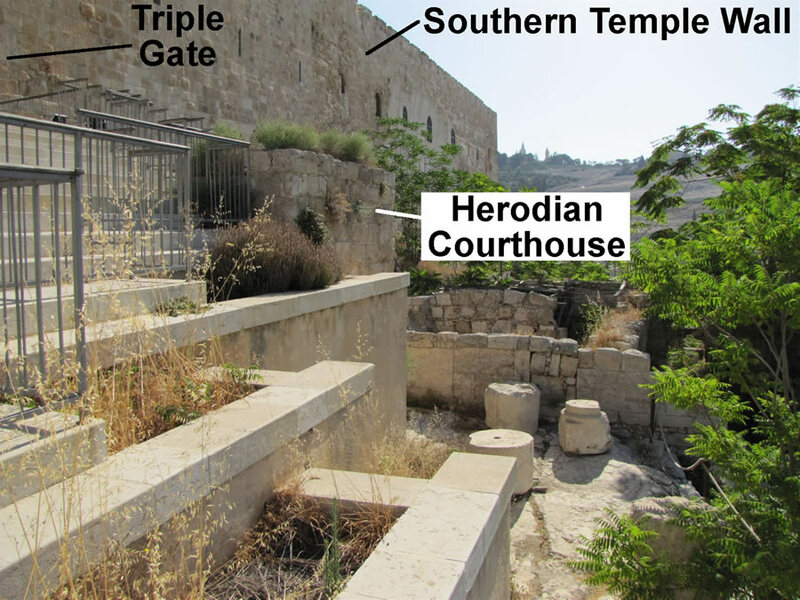 This is all that remains of Herod's original gate, called the Beautiful Gate, that served as an entrance to the tunnel and staircase that still exist behind this blocked gate. This ashlar is 48 inches long. 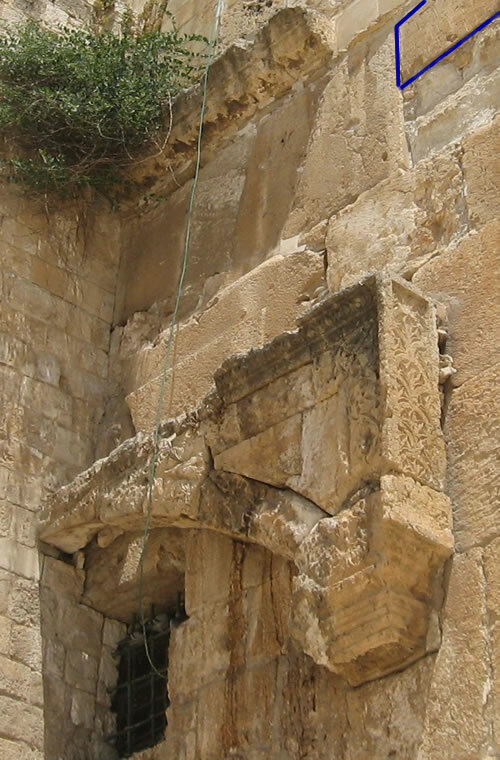 Eighteen inches are decorated with a classical gate profile, and the remaining 30 inches are carved in a style typical of Herodian ashlars. The Triple Gate was rebuilt during the Umayyad Dynasty (661-750). 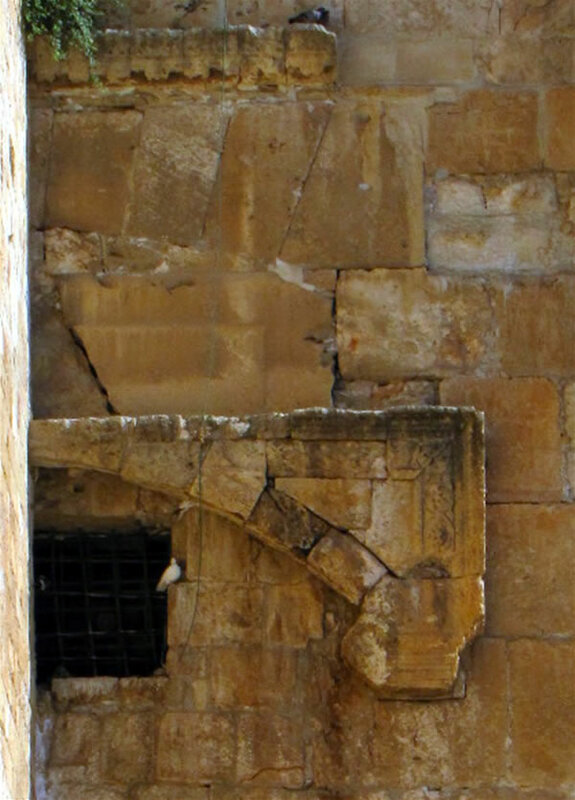 The Crusaders blocked it shut to protect themselves from the Muslims around 1100.
left (west) side of the Triple Gate. ashlar because they served as the “master course.” Notice that at the street level, the margin and bosses of a lower course of ashlars can be seen directly behind Toni’s feet. 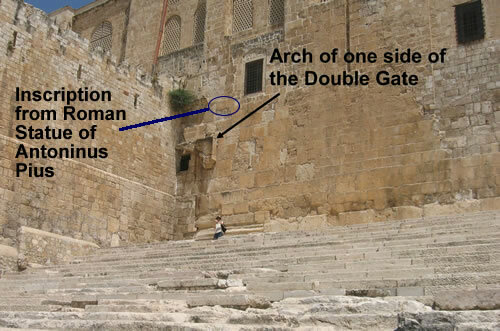 ashlars from the New Testament days can be seen in this course which is just left of the Triple Gate and continues to the Double Gate. The stones above this course are the work of Romans, Jews or Muslims (no one knows for sure) who rebuilt the southern wall of the Temple Mount. All we know for sure is the name that is inscribed. The details of who, when and why are unknown. Gate, and created burnt impressions of the arches. The impressions burnt onto the Herodian ashlars still clearly show where these shops and their vaulted walls stood. supported the paved street as it descended. Shops were located in these vaulted rooms under the street. A close up of a burnt impression. Pavement (or floor) among the ruins in the Ophel below the stairs. Herodian ashlars setting south of the Temple Mount. Watch Galyn's video taken from the southern steps of the Temple. Double Gate, Beautiful Gate and the huge staircase. The very top stone in the very upper right corner of this photo is a piece of stone from the base of a statue of Antoninus Pius that stood on the temple mound (outlined in blue). The stone contains an inscription. 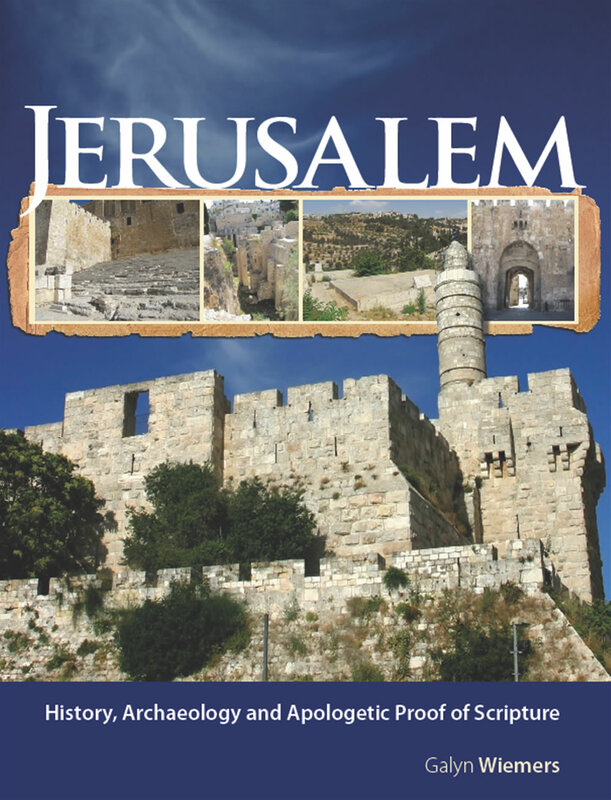 Hadrian would have had the statue set on the temple mount along with the Temple of Jupiter that he built after his defeat of the Jews in 135 AD. 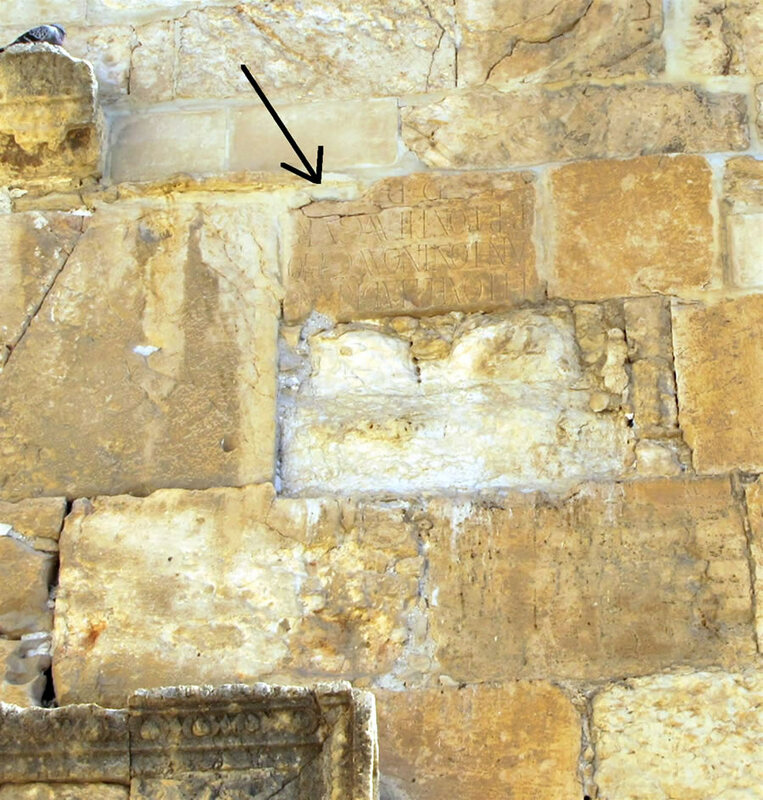 The block with the inscription from the statue has been reused and is placed in the southern wall of the Temple Mount upside down. The Roman Temple of Jupiter was torn down by Constantine. The stones were used later by the Muslims to build the Dome of the Rock and the Al-Aqsa Mosque. 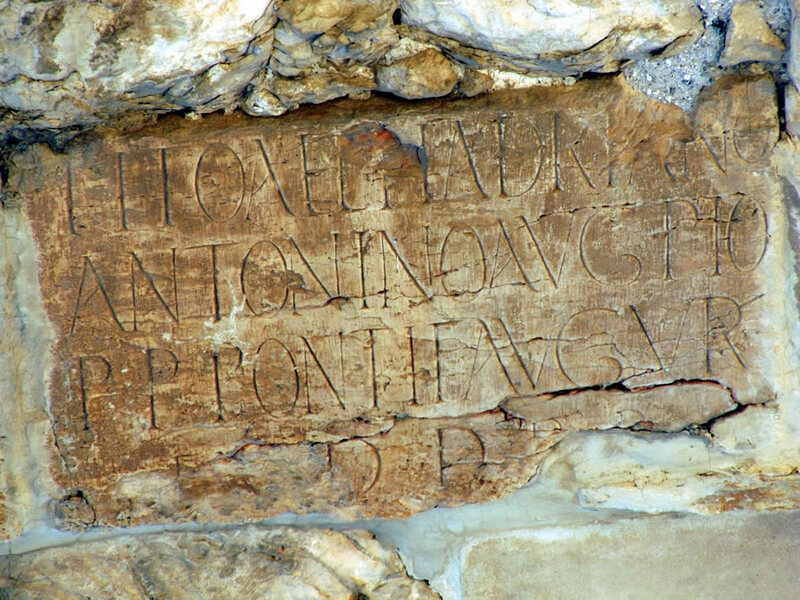 This inscription was found and placed upside down to replace a broken stone above this gate. "Hadrian erected an equestrian statue of himself on the Temple Mount. 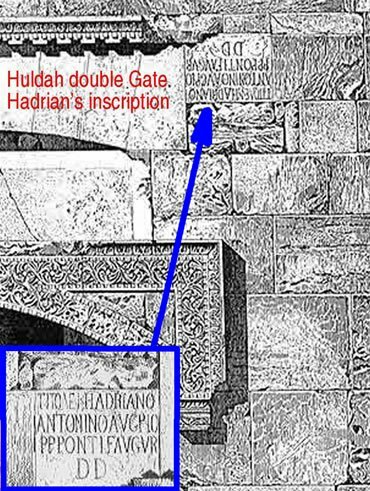 The anonymous fourth-century pilgrim known only as the Bordeaux Pilgrim reports that he saw two statues of Hadrian on the Temple Mount when he visited the site. The Bordeaux Pilgrim probably mistakenly identified the second statue; Hadrian's successor, Antonius Pius (138-161 AD), probably added an equestrian statue of himself, which the Bordeaux Pilgrim saw. . . 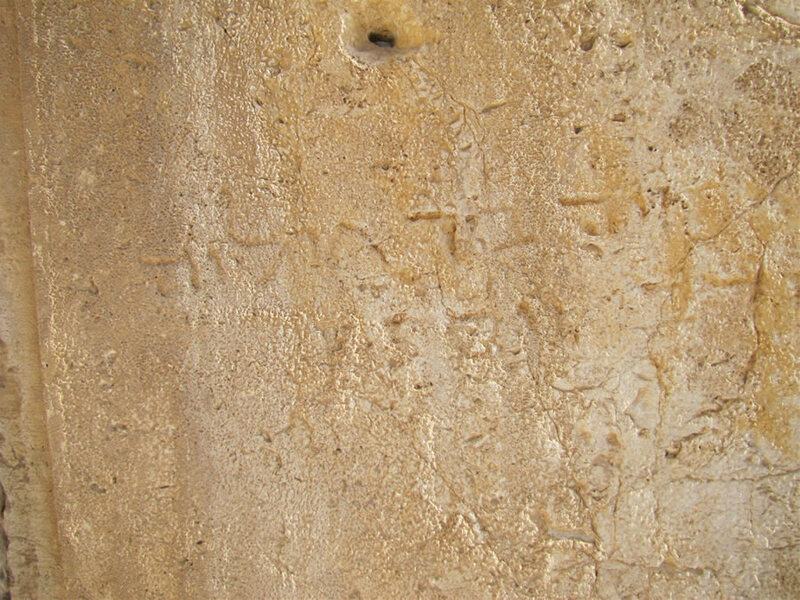 It is quite possible the the Bordeaux Pilgrim saw this inscription when it was part of a statue on the Temple Mount. But he misread it. Antonius had been adopted by Hadrian and named as his successor in 138 A.D. Thus, Antoninus's name included the name of Hadrian. The Bordeaux Pilgrim apparently looked only at the first two lines and concluded that it was a second statue of Hadrian. Both had a thick beard and looked much alike when they were older. Some modern scholars have made the same mistake and read the same inscription now in secondary use as referring to Hadrian instead of Antoninus. They apparently focused on the name Hadrianus, ignoring the following name, Antoninus.